Pinus strobus 'Niagara Falls' is a spreading, semi-pendulous selection of Eastern white pine with typical long, soft Blue-green needles and abundant secondary buds which flush out to create an exceptionally lush structure. The plant must be staked to it ultimate desired height, from which all future growth will extend outward and downward. Rate of growth at the terminals is 4 to 6 inches (10 -15 cm) per year, creating an imposing effect in the garden over time. [Iseli nursery, inc.] This handsome, cascading White Pine, chosen 2009 Collector's Conifer of the Year, was found as a sport of 'Pendula' and demonstrates a distinct improvement over that familiar landscape tree. The compact, weeping form boasts many draping branches and long, two-tone needles. Every dense, wide specimen develops a unique character and flowing habit that mimics the action of a roaring Niagara Falls. Found by Mike and Ken Yeager of Hickory Hollow Nursery in New York in 1998 while working on a landscape job, this is a distinctive specimen for the discerning client. This cultivar originated as a witch's broom in a specimen of P. strobus 'Pendula' found in 1998 by Mike and Ken Yeager of Hickory Hollow Nursery, New York while on a landscaping job. 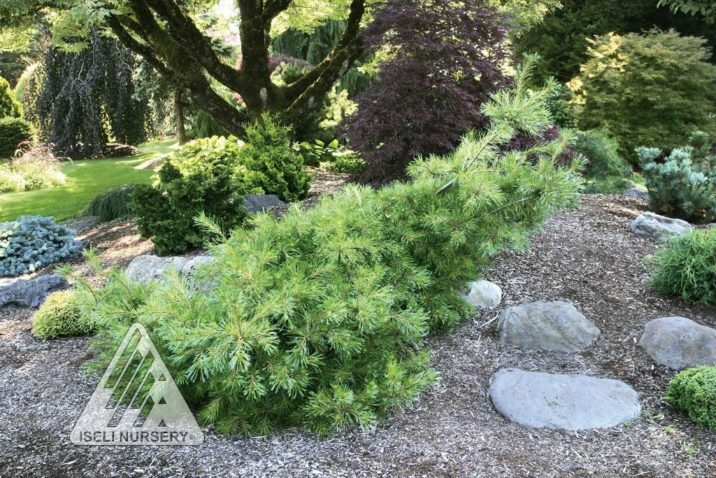 It was one of two plants selected in 2009 for the ACS Collectors Conifer of the Year program. Pinus strobus 'Niagara Falls' at the Jean Iseli Memorial Garden, Boring, Oregon. Photo by Iseli Nursery, Inc.